On Wednesday, Turkey retaliated against a Syrian mortar attack earlier in the day that killed five civilians in the Turkish border town of Akcakale. 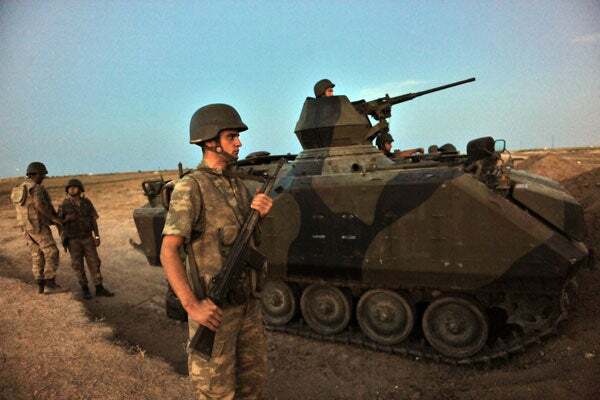 Turkey responded in kind with limited artillery attacks against Syrian army outposts. Whether planned or not, Syria’s shelling of Akcakale is just another step in the rising escalation between the bordering countries. Turkey was alarmed by other events happening in Syria, such as an emboldened Kurdish population within Syria. At least a fraction of Syrian Kurds support the Kurdistan Workers Party (PKK), a revolutionary terrorist organization that seeks to carve an independent Kurdish state out of eastern Turkey. The PKK—which launched a separatist insurgency inside Turkey that has claimed more than 40,000 lives over the past three decades—has threatened to attack Turkish troops if they enter northern Syria. Although Syrian president Bashar al-Assad would be well-advised to rein in the PKK to help assuage the tensions between Turkey and his country, he may have encouraged the PKK’s threats to deter a cross-border intervention by Turkey. Many Turks suspect that Syria has renewed its support for the PKK, which it halted in 1998 under severe Turkish pressure. Furthermore, drawing Turkey into the Syrian conflict would be imprudent to say the least, considering that a car bombing that killed 14 in Aleppo on Wednesday had the apparent fingerprints of al-Qaeda or a like-minded Islamist terrorist group all over it. Regardless of the softer rhetoric, Turkey’s limited artillery reprisal signals its resolve to push back more forcefully against the outlaw Assad regime. The Turkish parliament recently approved a measure allowing prime minister Recep Tayyip Erdo?an to send Turkish soldiers into “foreign countries” without consulting with the national assembly in Ankara. It is crucial for the United States to cooperate closely with its Turkish ally in order to help provide stability to the Middle East region. Adam Gianella is currently a member of the Young Leaders Program at The Heritage Foundation. For more information on interning at Heritage, please visit: http://www.heritage.org/about/departments/ylp.cfm.